I love cooking - like down to my bones, have to do it every day to live, love it! But sometimes, I want to find things that are not only quick and satisfying but also healthy. Enter Earthbound Farm and their new Chopped Salad Kit! I have fallen hard and fast for these new kits as they get dinner or lunch/brunch on the table super quick and limit the number of dirty dishes - it is a win win in my book. I have had a chance to try all three varieties (Asian, Southwest and BBQ Ranch) and I have to say all of them are amazing, but BBQ Ranch steals the show for me. I love the crunch of the sweet potato chips and the slightly sweet, tart dried cranberries. 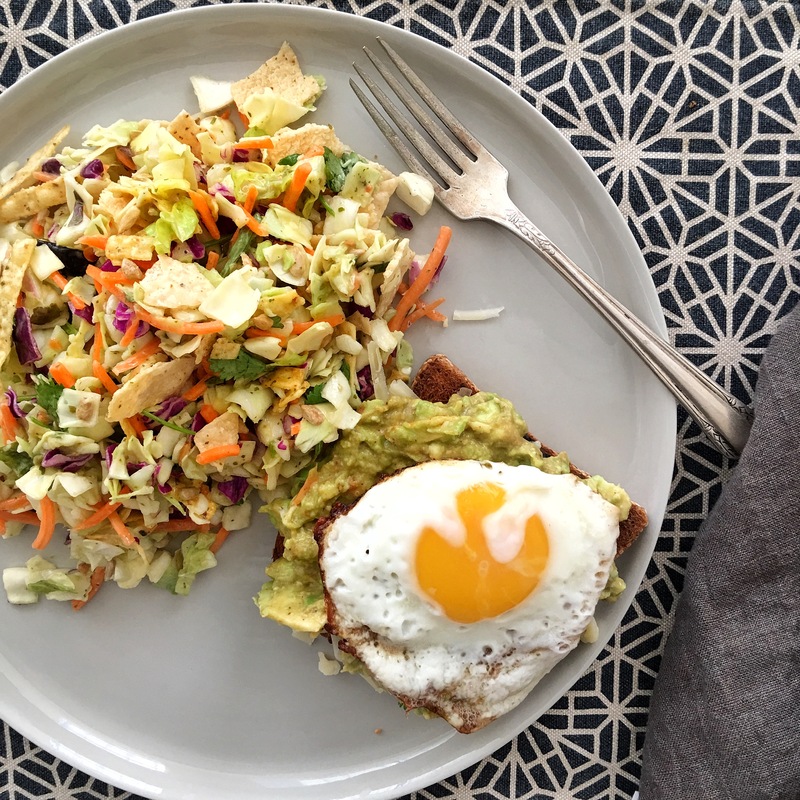 I paired this salad with some avocado toast (cheaters guac), a fried egg and brunch was on the table in less than 15 minutes. The smoky tang of the BBQ is the perfect complement to the creamy avocado, toast and egg! Prepare salad according to directions in a bowl and set aside. In a small bowl mash together the avocado, salsa, lime juice and salt/pepper. Cover and refrigerate until ready to use. While toast is toasting, cook two eggs over medium heat in a skillet until the whites are set and the yolks still soft and custardy. Place toast on two plates - divide quac between the two slices and top each with a fried egg. Divide the salad between the two plates and serve!